Frame from SpaceShipTwo Boom Camera during first rocket-powered flight on April 29, 2013. Soon, Virgin Galactic could be ferrying more than tourists to space on its suborbital flights. The company that aims to be the world's first commercial "spaceline" also plans to give scientists and educators the chance to fly experiments aboard SpaceShipTwo, its latest suborbital space plane. The first public flight is slated for December 25 and commercial service is set to begin in 2014. "We started building SpaceShipTwo with space tourism in mind, but we knew from the start that the same vehicles, the same mission and the same staff could be used for science," said William Pomerantz, vice president for special projects at Virgin Galactic. Suborbital flights will provide three to four minutes of high-quality microgravity, Pomerantz said. That's much longer than the roughly 30 seconds aboard parabolic aircraft such as the Zero-G plane, and is "a good stepping stone to the International Space Station," Pomerantz said. The cost to fly an experiment will depend on its size and mass, but prices will start at $50,000. Researchers will pay an additional $250,000 per person to fly — the same price space tourists will pay. Pomerantz, a graduate of Harvard University, the NASA Academy, and the International Space University, said he was frustrated by how few opportunities researchers had to fly their experiments in microgravity. Often, "you only get one shot," he said. Virgin Galactic hopes to change that. Researchers who fly aboard SpaceShipTwo could include academics, private companies, NASA centers and the Federal Aviation Administration (FAA), among others. One of Virgin Galactic's primary science clients will be NASA's flight opportunities program. Researchers who apply to the program could be funded to fly with their experiments on SpaceShipTwo. 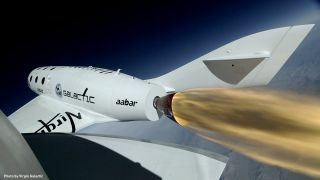 The arrangement is the first time that NASA has contracted with a commercial partner to provide spaceflights on suborbital spacecraft, according to a Virgin Galactic statement. In developing equipment for its science flights, Virgin has adhered to existing standards and common equipment. "We wanted to make sure we're not reinventing the wheel," Pomerantz said. In addition to human-run experiments, SpaceShipTwo flights will support autonomous experiments that provide a view through the spaceship's windows. Virgin Galactic is looking at ways of mounting experiments on the outside of the spacecraft, to allow for atmospheric sampling, for example. Virgin Galactic also intends to bring educators on its flights to do science outreach. For its tourist flights, Virgin Galactic has accepted nearly $80 million in deposits from about 640 individuals who wish to fly to space. SpaceShipTwo had its second powered test flight on Sept. 5. On Oct. 3, the company announced a deal with NBC to create a TV series called "Space Race," in which participants can compete to win a flight on SpaceShipTwo. SpaceShipOne, built by Paul Allen's company Mojave Aerospace Ventures with Burt Rutan of Scaled Composites, won the $10 million Ansari X Prize for being the world's first private team to launch a reusable manned spacecraft into space twice within two weeks. Editor's Note: This story was updated to reflect a correction on Oct. 21 at 9:22 a.m. EDT. The original article incorrectly stated that SpaceShipOne was built by Virgin Galactic.